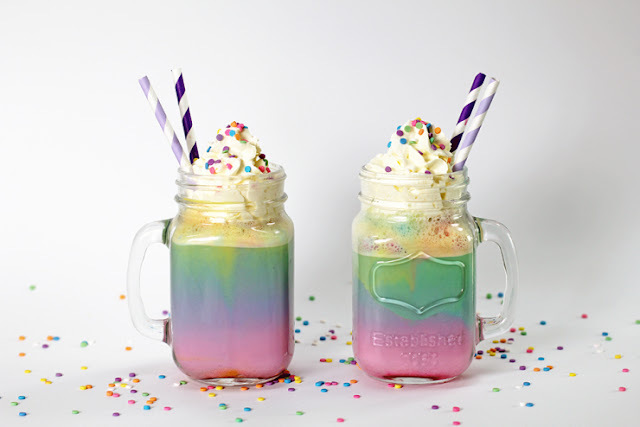 Smooth Rainbow Unicorn Milkshake- Hello everybody, welcome back with RedHood Kitchen! Today i will share how to make Smooth Rainbow Unicorn Milkshake. why it's call unicorn? it called unicorn because 'unicorn' had characteristic like bright colors involved, rainbow colour. in dessert, unicorn usually has typical sweet flavor, a lot of colour, and have sprinkle candy or sweet decorative toppings . So let's start to make it! pour your milkshake evenly into three bowls. Add another plain milkshake back into the blender. Then, add another food coloring, and blend. put your spoon in the glass. Pour slowly over your spoon with second colour milkshake, and use it to help the milkshake drizzle into glass.